This amazing film will never fade to purple due to its being constructed with nano particles of carbon-ceramic in between the layers of polyester. This enables the film to maintain a good look and remain extremely color stable. Ceramic window tint has quickly gained popularity for its incredible ability to block HEAT. If you want HEAT blocking technology, you've come to the right place! Also called "Infra-Red films", these films are made from ceramic Nano technology and offer the benefits of a dyed film with the high IR (infra-red) heat rejection. These films block out far more IR HEAT than conventional window films, giving you the comfort you deserve, while protecting your vehicle's interior from the damaging effects of UV rays during those HOT Indiana summers! Why Should You Consider Ceramic Film For Your Car? 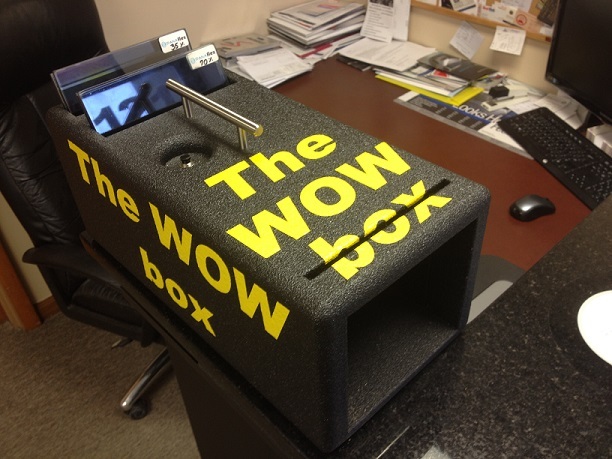 The Amazing WOW box - Seeing is Believing! Nano-Ceramic film -The Good... 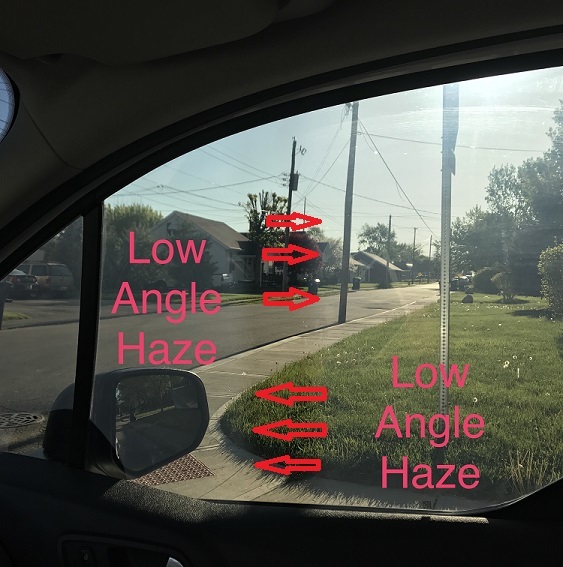 They block out up to 90% of the infra-red heat coming through the glass and best of all, without loss of radio signals to cell phones, radar detectors, tire sensors, GPS, etc. These films will save Hybrid vehicle batteries from premature drainage thereby increasing gas mileage and overall performance. They do not have a reflective look (think mirror), so they look like traditional color stable dyed window films only with the high heat rejection of metallic sputtered films. Our Nano-Ceramics have a Lifetime warranty with great performance! Talk about the best of both worlds!! So, Anyone's Ceramic Will Do, Right? Take a proven Dyed Film and Add Ceramic to it - this method relies on dye to vary the degree of darkness. This method also is dependent on the dye not to break down and turn purple. Since ALL dye eventually deteriorates and loses color, we feel it is an inferior way to make a "Ceramic" product. Most manufactures use this approach. Take a clear Polyester Film and Add Nano-Ceramic Particles to the Laminate thereby creating a product that is NOT dependent on dyed technology. This is the method our manufacture uses to make our films. We believe this method to be far superior and it is why we call it "Nano-Ceramic" as opposed to "Ceramic" to distinguish it from the competition. ANY Manufacture of Ceramic films can get the IR rejection to 100%. However, in most cases the clarity of the film is compromised due to an issue called LOW ANGLE HAZE or "LAH"
FACT: ALL Ceramic Films have Low Angle Haze. However, our films have the highest IR rejecting properties with the CLEAREST view of any Ceramic film on the market, BAR NONE! Don't settle for just ANY Ceramic film. Compare Apples to Apples when considering a High IR Rejecting Film. Otherwise you may be disappointed. Window film nanotechnology has gone through four generations. We are at generation four, the newest generation. In generation one, we used dyed polyester in the film construction. The reason for this was that there was a challenge to reduce the particles of carbon in the laminate adhesive. The particles were too large. When they're too large, they reflect sunlight and cause low angle haze. Our nanotechnology in generation two improved. We got the particles smaller, but there was an inconsistency. We still had the same problem in generation one. In generation three, we figured out how to make the particles even smaller. Unfortunately, the particles clumped together resulting in more "Low Angle Haze" than what we wanted. This is where we are today. We have two ultra clear layers of polyester with no dye, 100% nanotechnology. The carbon particles have been chemically encapsulated to stop the clumping, greatly reducing the low angle haze resulting in an optically clear film with HIGH Heat Rejection and Performance. Given the fact that Nano-Ceramic films do so much more to keep you cooler than traditional window films, and the cost is just a few dollars extra, why wouldn't you choose them for your car? If you REALLY want the Ultimate in EXTREME HEAT REJECTION you should consider our new ULTRA Nano IR 98% rejection film. How is Ceramic Film made? The key ingredient is a chemical compound called Titanium Nitride [TiN], a tough ceramic material. TiN contains exceptional infrared (IR) reflective properties, which allows the film to reject the sun's heat at a higher rate compared to traditional films. TiN is also extremely durable. Our window films are constructed with no dye. What does this mean for you? Your window film won't fade to that awful purple that is so common among dyed films. The mounting adhesive layer consists of double the glue compared to other films, which means a longer lasting film. The magic happens in the laminate adhesive layer. In this layer, nano particles of carbon give the film its shade and give it increased solar benefits. The hard coat is strong and durable due to the nano-oxide material injected into the layer. Nano-Ceramics Work Better Than Anything Else! Our Nano-Ceramic films share the same technology from the multi-Billion dollar industry that makes flat panel TV screens, Smartphones screens, and Solar cells. ALL our Nano films rely solely on cutting edge, Nano technology - not dye. This makes them color stable (no purple), as well as signal friendly, while maintaining a crisp and clear appearance. 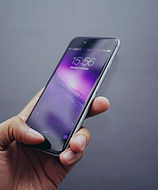 Ceramic films were the result of cell phone technology. 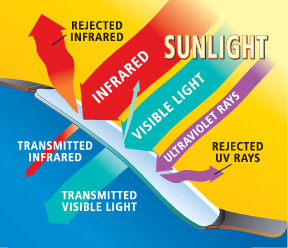 Actually, ceramic films are the result of cell phone reception interference caused by metallic window tinting. Metalized films or "Sputtered films" as they are known in the window tinting industry, were developed to increase heat rejection. SPUTTERED FILM - The Good... Sputtered films worked great in keeping the cars cooler! Because tire sensors, GPS equipment, and radio antennas inside cars would not work, there came a need for a high heat rejecting film that would not cause RF interference like the metallic films did. The result... Ceramic Window Film! These films are actually colored with ceramic based nano particles and contain no metals or dyes. They last longer and reject heat better than traditional films, without the signal blocking aspects of metal films. 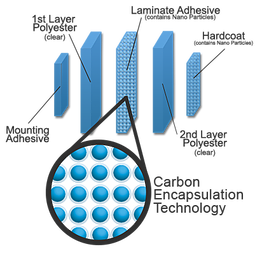 Nanotechnology is at the core of our products Borrowing nanotechnology that can be found in solar cells, smart phone screens, and high-definition television screens, our products are manufactured for performance and quality.